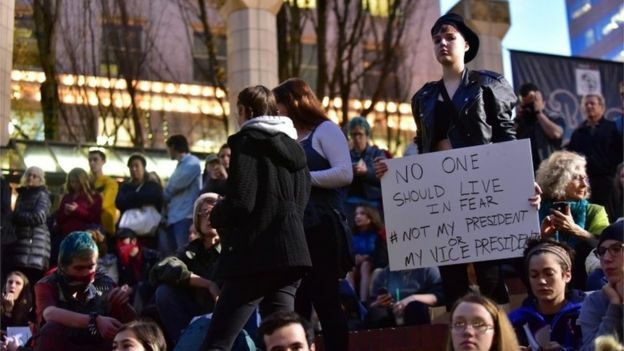 Google images: portland trump protest. It's been a crazy week in Portland. Believe me, I've said that before. I never really meant it until now. 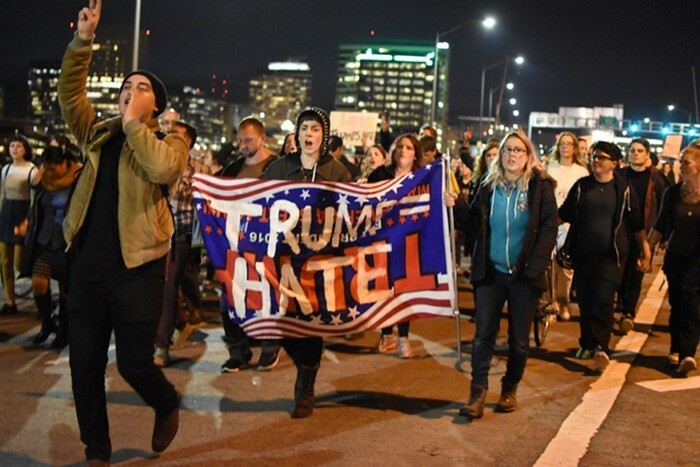 Several roads have been closed, arrests have been made on a daily basis, and there is no sign of the anti-Trump protests slowing down. It would be easy to get mad. Or afraid. Or annoyed. Or all of the above. Instead, I'm staging a little protest of my own. I'm protesting my knee-jerk response of self-preservation and choosing a different reaction: grace. I met a friend in Portland this summer who no longer believes in God. He's also openly gay. Despite his reservations, he came to one of our preview services for Spring of Life Church and we've been meeting for breakfast ever since. We come from two different ideologies. Culture says we should hate each other. And yet...I love my friend. I mean it. I really love spending time with him. He doesn't feel like a "project" to me. In fact, our friendship is changing my life in some small yet significant ways. We haven't exactly set aside our differences. I still love Jesus with a fervor that only seems to grow with every week in this post-Christian town. I still know exactly who he is and where he stands. I think our friendship is working because we've got an unspoken agreement. We're going to show grace. It's helped me realize that there might be a power that could change everything. Grace = undeserved goodness. It's the foundation of our faith. In general, I don't think many Christians have a great concept of grace, and it's because we confuse it with mercy. Mercy is when a person is spared from a consequence they deserve. This is an idea that we're pretty comfortable with. The Bible teaches that we're separated by our sins from a God who yearns to know and love us. In order to restore the relationship we were created for, someone had to pay a price. Jesus marched toward a death of agony and torture as he carried His own cross to Golgotha, outside the city gates of Jerusalem. He also killed Shame, Death, and Evil when He conquered the grave. Many Christians humbly accept this gorgeous gift of forgiveness. But the Gospel doesn't end there. Not for us, and not for others. The Gospel says that forgiveness doesn't just wipe away the sin to leave us empty. Rather, it cleanses us to make way for all of God's goodness. Most people don't know how to deal with this. Like most things of an eternal nature, the real battle is believing. In ten years of ministry, one of the biggest struggles I've seen people face is how to accept the grace of God. Here is how the thinking goes: I know Jesus saved me by His mercy. Now I want to prove to Him that I'm a good investment by doing good things. Here's the problem: my goodness never measures up. In order to be truly good, I have to inherit His goodness. Most days, I don't feel worthy...and that's entirely the point. I've never been worthy of His goodness and I never will be. 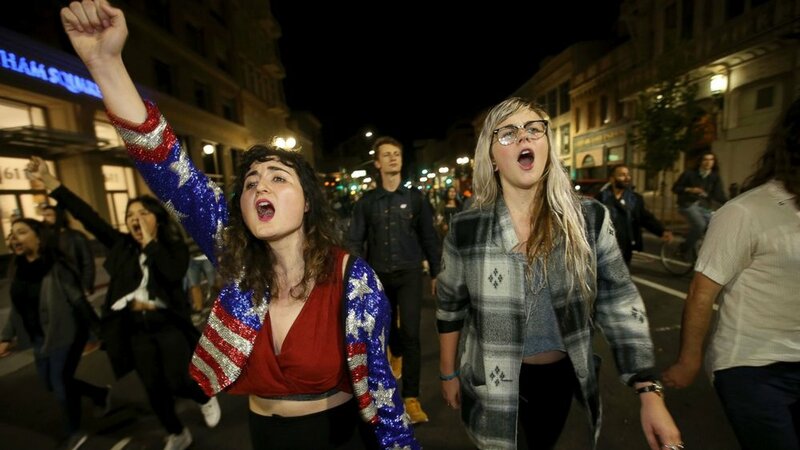 Neither will the people who disagree with me. When it comes to grace, we're all in the same boat. We are desperate for it and God isn't stingy. So...why are we so stingy? Jesus also lived in a time of political unrest. The overwhelming expectation that Jews had for their Messiah was that he would make Jerusalem great again. He didn't. In fact, He predicted its destruction. Jesus never taught people to fight for their rights to be defended by the government. He never trained His followers to believe that making disciples had anything to do with imposing their values through external laws. Instead, He pointed to a new kingdom, and He taught that it only comes by grace. He's inviting us to a life that can't be tarnished by brokenness and sin. It's also a life that cannot be stolen. Here's what that means: Christians should never feel threatened. This world isn't a place that should feel like home -- not really. The world, according to kingdom theology, is a sinking ship from which people must be rescued. In that analogy, why on earth would it make sense for the people in the lifeboat to get angry at the people who have yet to find safety? Why on earth would it make sense to show anything but compassion? If heaven is real, it changes everything. It means that every waking moment is an opportunity to see others saved from a godless eternity. How can people ever begin to find God's grace if all they know about Christians is what they're voting against? How can they ever find this goodness if they've never tasted it from the people who claim to know the One True God. Let me tell you why I love Jesus. It's not because I was born into the right family. That wasn't enough. It's not because I like the social status of being a Christian. That would've grown old a while ago. It's not because it's my pathway to a slightly nicer life. (In fact, Christianity is what uprooted my comfortable Georgia existence for something entirely more...adventurous.) Here's why I love Jesus -- It's because He waded into the mess of my life and offered me goodness. He did this time after time, even though I never deserved it. And now, He's calling me to do the same. I can only show grace to people if I feel they don't deserve it (at first). If I find myself only loving people that are easy to love, it ceases to be grace. In order to live like Jesus, I need to find people that make me mad -- and I need to love them. I need to find people I disagree with -- and I need to show them compassion. I need to find people that threaten me -- and I need to care about them. Deeply. I can only do this with a love that is not my own. When we unleash this kind of love on an unsuspecting world, we destabilize the darkness and let all heaven break loose. I don't know about you, but I'm ready for that kind of change.